"Here sat Marilla Cuthbert, when she sat at all, always slightly distrustful of sunshine, which seemed to her too dancing and irresponsible a thing for a world which was meant to be taken seriously; and here she sat now, knitting, and the table behind her was laid for supper." "Slightly distrustful of sunshine" sums up my attitude perfectly. Sunshine can turn on a dime and bring wind, cloudiness, rain and even hail. I've walked out of the house on sunny days wearing just a sweater and regretted it, shivering throughout the day. I've also layered up at the sight of cloudy skies only to suffocate because it was so warm and humid outside. It's typical for Vancouverites to have sunglasses perched on their heads and umbrellas in their hands at the same time. The weather may have finally warmed up and brought some much needed sun, but I'm not ready to bring on the dresses and sandals yet. The distrust runs deep. A 3/4 sleeve cotton cardigan, cuffed jeans and crisp white ballet flats are a nod to the season while still providing warmth when the breeze gets brisk. Speaking of cardigans, I'm absolutely in love with the Bette cardigan I'm wearing--a find from my shopping trip to Vancouver's first Anthropologie with Alicia. (The necklace is from the same shopping trip!) It's my idea of the perfect spring sweater: high-quality cotton-blend knit, 3/4 sleeves, flattering classic proportion, bright colour. So tempted to return and get it in another colour or two. To my Canadian readers, Happy Victoria Day long weekend! What are your plans? I love it! Here in Portland we have to be very distrustful of sunshine. Nothing is guaranteed until July. You look so cute and cheerful! The weather in Boston's been about the same... sigh. I'm with you. It's warm out, but I refuse to wear sandals until it has STAYED warm for several weeks. Lisa, you do modern-with-Chanel-influence so beautifully! Eee, love the bright colour of your new cardy! And I get what you mean about being distrustful of the sunshine... I am trying to be positive right now and hope it lasts! I'm not doing too too much this weekend... it's my friend's wedding and also my boyfriend's birthday so there will be lots of celebrations. love the red and white, reminds me of something you'd see on gossip girl season 1 when theyre still in school! Oh noes... where did my comment go? 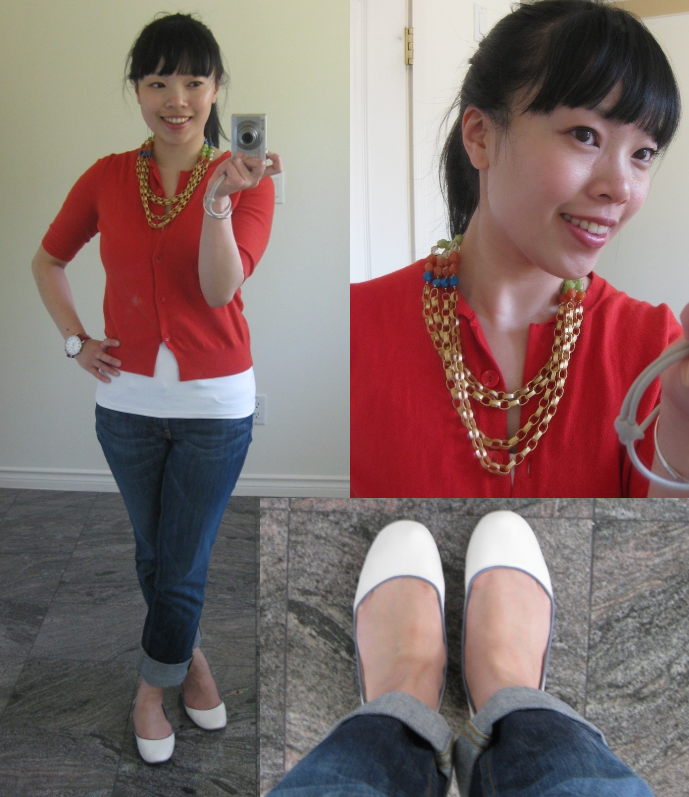 Okay, to sum up, I said I heart Anne of Green Gables too, and the red sweater plus gold chains combo is really cute. I love your outfit! Red is such a great color on you! the cardigan looks so cute on you! I totally agree with you in regards to Vancouver weather. We definitely have incredibly wild wild weather. Can't be tamed. Can't be predicted. But I still wouldn't change a thing, I love this city! Oh, and I love the colors in the necklace, spring perfect. Love the simplicity of your outfit with a pop of color in your cardigan.